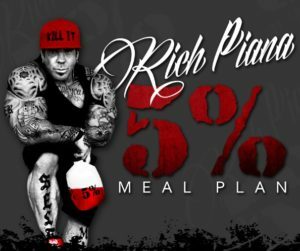 Bodybuilding Meal Plan by Rich Piana: Lifestyle Meal Delivery! It takes a lot of hard work and dedication to get the ideal physique of a bodybuilder. For most of us, the lifting part is fun and easy. The real struggle is eating the right food, and enough of it to make gains! We give it to you straight here: Rich Piana’s Bodybuilding Lifestyle Meal Plan is AWESOME – at least 7 of the 8 meals are!! It’s a pain for the average person to closely monitor their calorie intake, measure out their portions, and do proper meal prep each and every week. But, if you want the body of a god (or goddess), you have to be willing to do work on your diet, not just your workouts. What if there was a meal delivery service that was specifically geared towards the athlete who dreams of getting big like a pro bodybuilder? 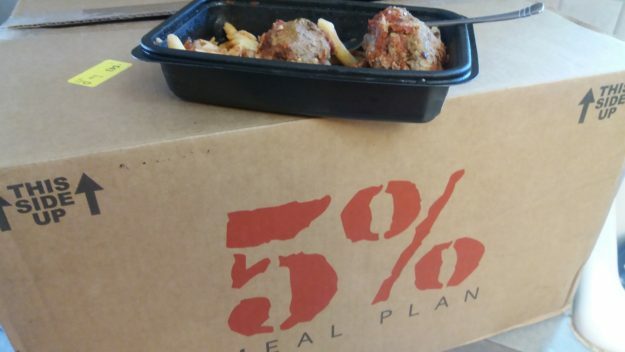 Lucky you for, Rich Piana and 5% Nutrition have developed a bodybuilding meal delivery service just for that crowd: The Bodybuilding Lifestyle Meal Plan by 5% Nutrition! Earlier we discussed Rich Piana’s Meal Plans in general, but now it’s time to focus specifically on the Bodybuilding Lifestyle plan. This meal plan brings the typical low-fat, high-carb, high-protein “bro diet” meal plan right to your doorstep, once per week, and when we say high protein, we mean it!! Team PricePlow’s Bodybuilding Lifestyle meal plan short review is just below. You can also subscribe to our YouTube channel to wait for the long one next! Let’s cut right to it, and get into our general review / discussion of the meals. A longer review with pics of the food is coming later! Long story short? If you’re shopping for a real meal plan, that’s actually high in protein, then keep reading, because someone has finally given us what we want! Bodybuilding Meals by Rich Piana! Rich Piana and 5% Nutrition have finally released a meal service for the aspiring bodybuilder that’s loaded with high quality nutrition, and affordable! We’ll give it to you straight: to get big, you are going to have to eat big. That means spending extra money each week on more high-protein food to increase your caloric and amino acid intake so you’re fueling actual muscle growth. The issue often comes down to one of two things: time or money. 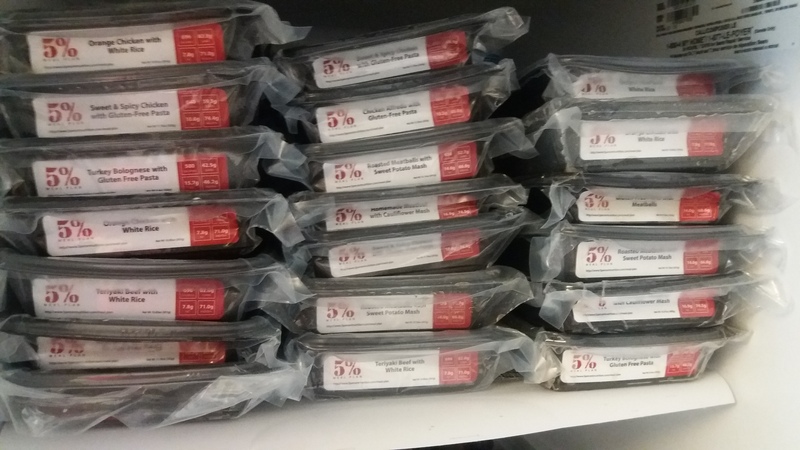 Here’s where Rich and 5% Nutrition come to the rescue. 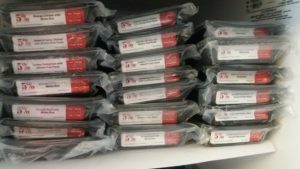 In crafting his meal prep and delivery company, Rich set a goal to have each meal contain high quality, minimally processed foods that weren’t much more than $6 a piece, yet still contain all the vital macro and micronutrients needed to fuel growth and repair of your muscles. As you’ll see, you can often make one and a half or even two meals out of some of these “meals” too – they’re absolute monsters!! But is there really anything new about a healthy meal delivery service? Those have been around for years! Well, that may be true, but we dare you to take a look at other meal services compared to Rich Piana’s. You’ll quickly realize that the total price for the meals as compared to other food services, and even fast food, is significantly less, not to mention the quality and quantity are both substantially higher than fast food! Even factoring in the cost of shipping, it’s still a heck of deal. They do not skimp on the protein here! We can tell you for a fact that Rich is not profiting very much on these. Most meal plan services are absurd, with either low-protein foods or high costs. This has neither of those problems. Now that’s a happy fridge! With all of that out of the way, it’s time to see what you’ll actually be eating on a regular basis with Rich’s Bodybuilding Lifestyle Meal Plan. In total, you get eight different meals to choose from including a wide variety of foods: it’s not just different variations on chicken, brown rice, and broccoli either! No more bored bro’s eating the same damn thing over and over! Mike’s Italian and knows his food. Even he said these meatballs were LEGIT! 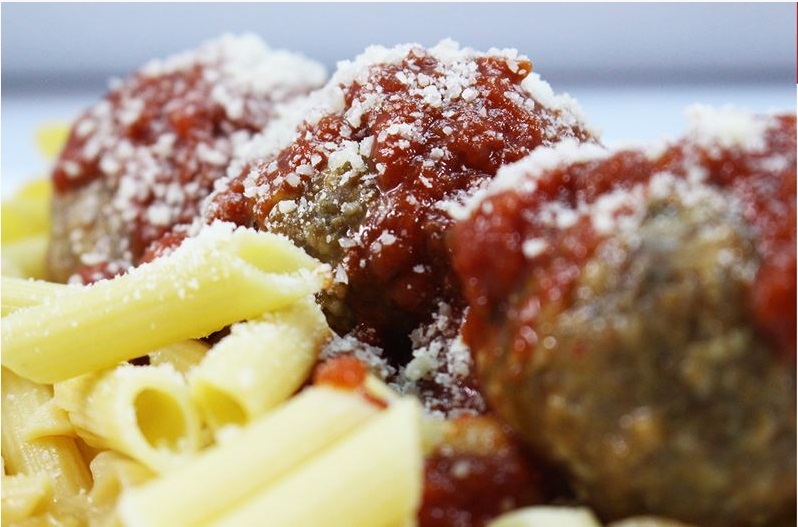 A staple in everyone’s diet is spaghetti and meatballs. There’s something comforting about this Italian-American classic that still holds true no matter what day and age we live in. A thick red sauce covers the bed of gluten-free penne pasta for a meal that’s both high in carbs and protein, ideal for the growing bodybuilder. Yep, licked that one clean (this is from the original picture up top). More coming in YouTube!! Mike is Italian with some fantastic cooks in his family, and in his review, he absolutely loved these meatballs! They are absolutely perfectly spiced. The meatballs are monsters, and we’re guessing that some of these portions will net you more than 70g protein because they’re so big. 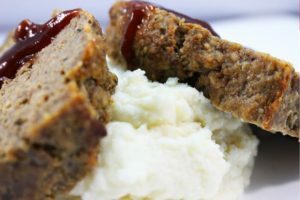 Everyone has a favorite meal that their mom or grandma used to make, and for many of you out there, it’s probably meatloaf. Plus, what’s meatloaf without some kind of rich, savory mash to soak up the gravy and juices? For this reason, Rich & Co. have included a carb-friendly cauli-mash to mimic the same luscious taste of mama’s mashed taters. Don’t be scared off by the cauli-mash, it actually tastes like real mashed potatoes! The cauliflower mash is spiced perfectly – it legit tastes like mashed potatoes, but is providing you with a beneficial serving of healthy vegetables instead. The meatloaf, like the meatballs, are very flavorful. We can foresee some people unchecking this box, stating that they don’t want this meal. We can tell you that this would be a mistake — this meal was very underrated!! A Chinese food favorite, this is Rich’s take on sweet and sour chicken. 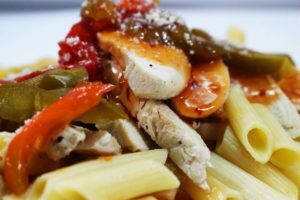 A tangy, tart, and a little sweet sauce covers thick slices of chicken on a heaping mound of pasta. The flavors on this one work out well, it’s truly got a sweet and spicy kick. In Mike’s YouTube review videos, you’ll see him adding more garlic chili paste, but most people will be happy with the flavoring right off the bat. Spice junkies just need to add their own since not everyone can handle tons of hot sauce. This one does indeed have a sweet and spicy kick, but if you really want to bring the heat, add some chili paste! Another favorite of Asian food lovers is Orange Chicken. Here, thick slices of chicken breast are adorned in a mouth-watering Orange sauce that’s a little bit sweet and a little bit spicy. 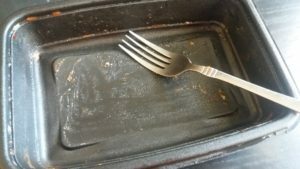 There’s no longer a need to call the local take-out joint down the street for the gloopy, excessively sweet orange chicken any more! The big note here is that the flavor is on, but there’s no fried breading on the chicken, as expected from a low-fat diet. The chicken, however, cooks perfectly. It’s amazing how they’re doing their cooking timing, because it does not come out rubbery or chewy. Bet you didn’t think you could enjoy rich, creamy pastas in a bodybuilding lifestyle, did you? Well, with Rich’s meal prep service, you can have your creamy, rich alfredo sauce and still have plenty of macros/calories left at the end of the day. Since it’s low-fat, it’s not as ‘creamy’ as you may like it, but it’s definitely not dry and is far better than anything we’ve put together on a low-fat diet. A great change-up from the other meals. If you’re a fan of salty Teriyaki sauce, this one is a winner. We’d add broccoli here though. A Japanese steakhouse classic. 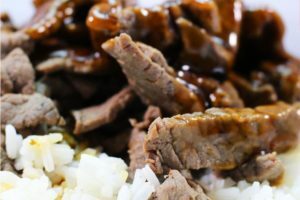 Thin strips of beef seared to perfection and topped with a salty, sweet, spicy sauce that’s tempered by the bed of white rice to form the perfect bite. Don’t be concerned when the white rice looks a touch uncooked before you put it into the microwave — that was done on purpose, as it comes out perfectly once it’s microwaved! This is going to be a hit-or-miss flavor depending on if you like the teriyaki. Mike loved this, but his girlfriend thought it smelled bad. No matter, it tasted great! Our one comment here is that this would be a good opportunity for Team Piana to throw some broccoli in here to appease us bro’s and veggie eaters! Mike also added red chili paste to this one, as he does with any asian type of food to kick things up a notch. 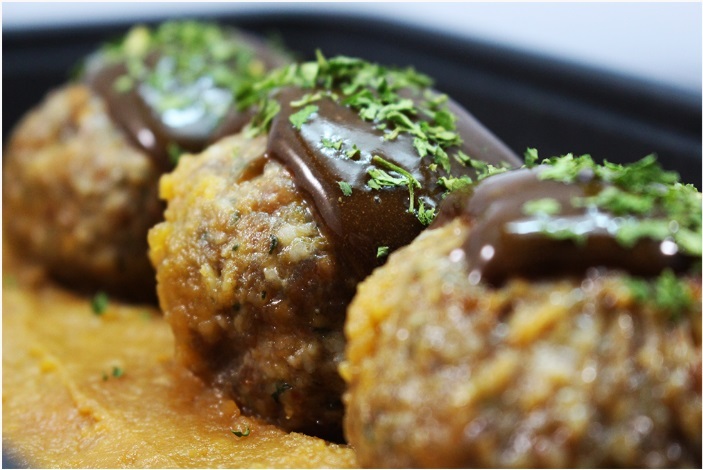 Here’s a closeup of the meatballs with brown gravy and mashed sweet potato. Here’s a different spin on meatballs! Rather than a thick and hearty red tomato sauce to adorn the balls of beef, 5% Nutrition nestles these meatballs in a savory thick, brown gravy and served over a bed of mashed sweet potatoes. Yep, once again you get the monster meatballs, and they’re just so damned good. The sweet potato mashed potatoes are done perfectly too – it wouldn’t be a bodybuilding lifestlyle plan without some sweet po, bro!! Pasta and meat sauce is a classic American favorite that many people have grown up eating over the years. 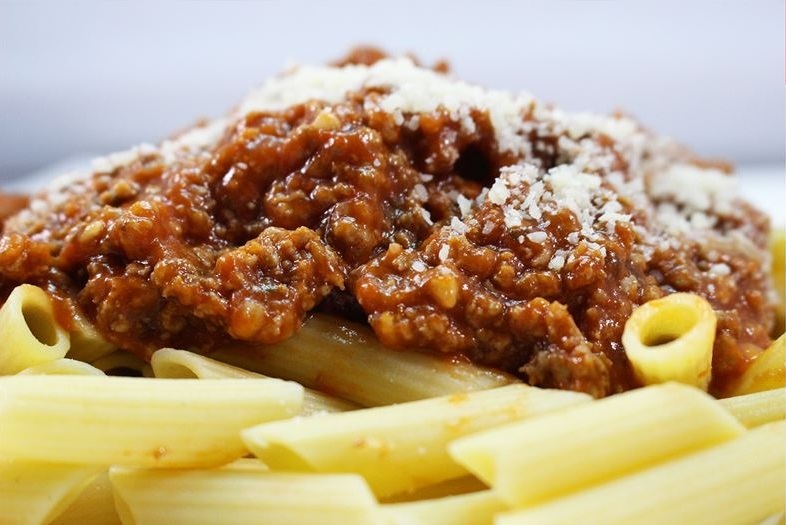 A luscious thick red gravy over a bed of penne pasta should make any bulking carb-fiend happy! Unfortunately, this was the one dud in the batch, but going 7 for 8 is outstanding for a home meal service! WARNING: This is the one meal the team did *not* like! We are going to recommend 5% Nutrition “reformulates” it, and right now, we think you should uncheck this box when deciding what meals you want. Reason being, there were too strong of citrus flavors here, which just didn’t seem to work with the turkey. So it’s a new meal plan that batted 7-for-8 with us, and the protein portions are HUGE. Somewhere in the video, Mike says you can expect macros to be roughly “15 fat, 45 carb, 45 protein” — that is WRONG. Some of these meals go as high as 80g protein! There are no breakfast foods, and no desserts — not yet at least. You’re on your own for the eggs and oats, but we have zero problems downing one of these meals as a breakfast instead. It’d be prudent to add a couple servings of fruits each day, though, since we’ve shown that eating fruits and vegetables causes you to live longer due to less cardiovascular disease. Rich Piana is a fan of real food, so for dessert, you can either grab a Bhu Fit Bar (quality food-based protein bar) or stick to a nice piece of fruit. 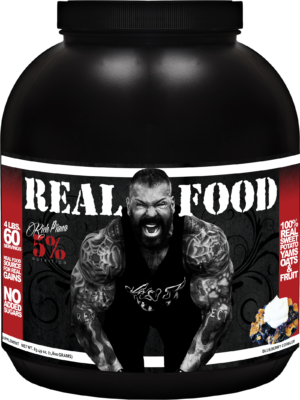 And of course, if you need to boost your carb intake for a big day, grab some of Rich Piana’s REAL FOOD, and read Mike’s REAL FOOD Review. As you can see, some of these meals are big. Like, so big that eating just two of them may put you over your macros! 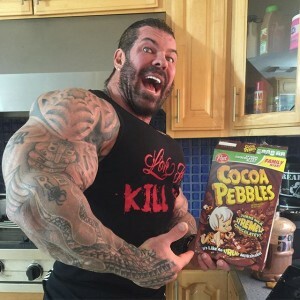 Further, Mike measured out one of the meals and it was actually a bit heavier than what the label said – so Rich Piana is definitely not skimping here. So if you’re a gal or smaller guy who doesn’t need 2400 calories in a day, you may end up needing to cut these in half. To most of us, this is a great “problem” to have — we just want tons of calories and protein. But if you’re small and don’t want to gain weight, you might not be able to blast down three meals a day. To us, that’s an awesome thing. To you, it may not be though, so know your metabolism! Or just eat up and work out harder… that’s what you’re supposed to do anyway! Forcing your body to do something it intrinsically doesn’t want to do is a very arduous task, and that’s exactly what packing on muscle is, hard freaking work! As hard as you work in the gym, that’s as hard as you have to work on dialing in your nutrition and hitting your macro / calorie goals each and every day. Click the image to see all Rich Piana 5% Nutrition Supplements! However, with the advent of Rich Piana & 5% Nutrition;s Meal Delivery Service, all the effort and work of cooking, cleaning, and prepping is taken care of. Their Bodybuilding Lifestyle Diet is easily the best of its kind, and is well worth the cost for the right person who doesn’t enjoy spending Sunday afternoons bulk cooking and measuring things into tupperware all day. True high-protein, high-carb, low-fat meals with legit food sources. All you have to do is pop open the microwave, heat it for a few minutes and eat. The best part is, you’ll fill up without feeling like your wallet got emptied in the process – because now your grocery bill can shrink to $7/week from just buying fruits!! No Comments | Posted in Food, New Products, Supplement News | Tagged 5% Nutrition, Diet, Low Fat Diet, Meal Delivery, Meal Replacements, Rich Piana.